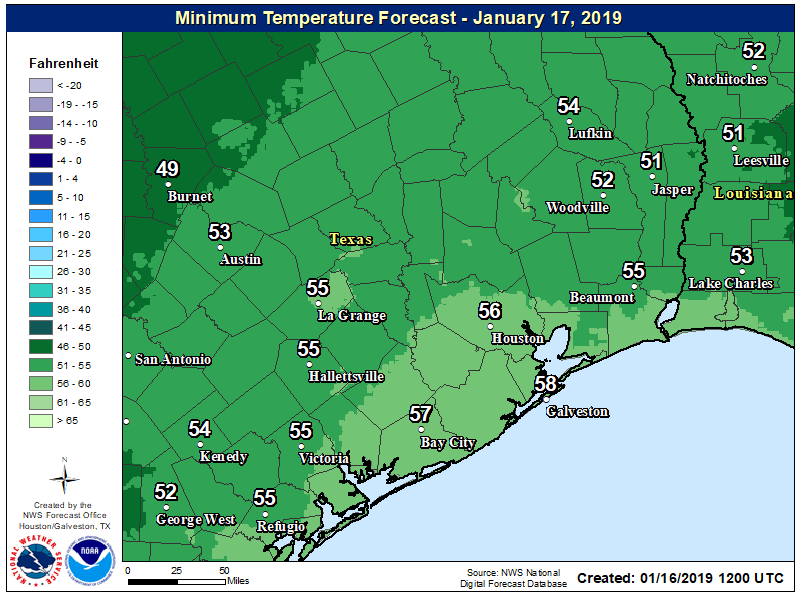 After a few days during which highs failed to get out of the 50s for most of Houston, our region’s weather pattern will now turn warmer for the next few days. We’ll see on-and-off rain chances through Saturday morning, by which time a strong Arctic front will sweep through the area. Forecast models have backed off with some of the more extreme cold, but much of the area should still see a light freeze. Winds will shift to come from the south this morning, and this will initiate a period of rising moisture levels and temperatures. Light rain showers will be possible today, with better coverage—perhaps 50 percent—likely closer to the coast. Accumulations won’t be above a few tenths of an inch. Highs should get into the low 60s, and lows tonight won’t fall much below that. Rain chances will continue overnight, with the better rain possibilities again near the coast where moisture levels are highest. Cloudy skies will continue, but in terms of rainfall this should be a mostly dry day with only isolated to scattered showers after sunrise. Expect highs in the low 70s as warm air really starts to move in from the south and southwest. 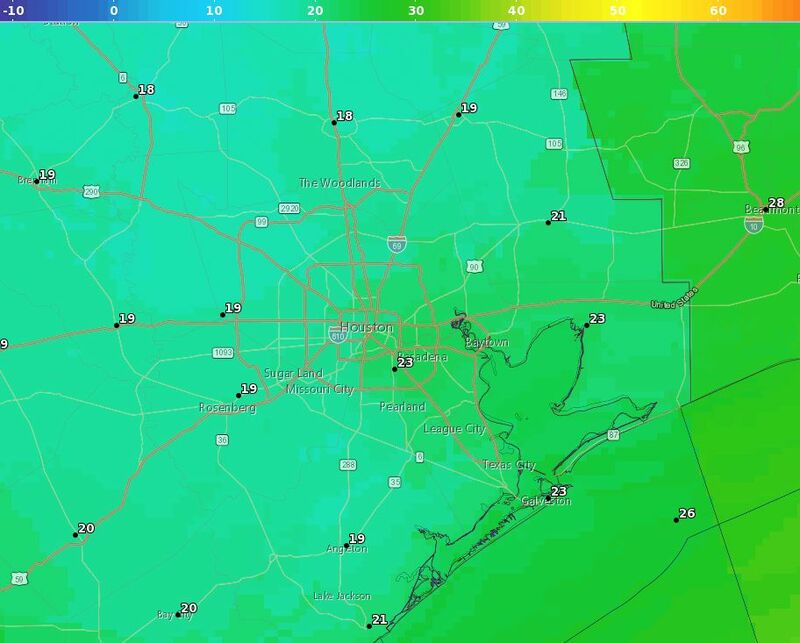 Lows Thursday night probably won’t fall much below 60 for most of Houston. Rain chances should begin to increase later Friday morning and afternoon, as a strong cold front nears the region. The best chance for heavy rain appears likely to come later Friday night (80 percent), perhaps around midnight, through mid-morning on Saturday when the front actually sweeps through. There is the potential for some thunderstorms and heavy rain, but we’re not anticipating anything too intense right now. Totals for most of the region should be between 0.5 and 1.0 inch of rain for all of this week, so we don’t anticipate any problems. Before the front arrives, temperatures will be in the 70s Friday, and 60s Friday night. The front should drop them immediately into the 50s. We should see clearing skies throughout the late morning and early afternoon on Saturday, as stiff winds blow in from the northwest. We’re likely to see gusts above 30mph, and this should produce a wind chill even before sunset that feels like the 30s outside. Much of the city should see a light freeze on Sunday morning, with winds remaining gusty through the mid-morning hours. For marathon runners, the “good” news is that we’ve seen some of the forecast models back off with the winds slightly, so now we’re anticipating start line temperatures right about freezing, with wind chills in the low 20s. (This is better than the possibility of wind chill temperatures in the mid-teens). Skies will be clear, with highs rising into the mid-40s by Sunday afternoon. Temperatures Sunday night should be similar to those on Saturday night. Most likely the region will see a warm-up into the mid-60s by Tuesday before another front arrives. Models are split as to rain chances with this front. Most of the rest of January is likely to see near normal, or cooler than normal weather. What’s the threshold for wrapping outside pipes and shutting water off from sprinkler systems? We are not going to get close to that, IMO. The threshold is generally about 25 degrees. Thank you for these updates! Do you mind giving anticipated wind chill for 7, 8, 9, and 10? Hi Chris. Right now I’d anticipate a slow rise in wind chill temps from the low 20s at 6am to about 30 by 10am. 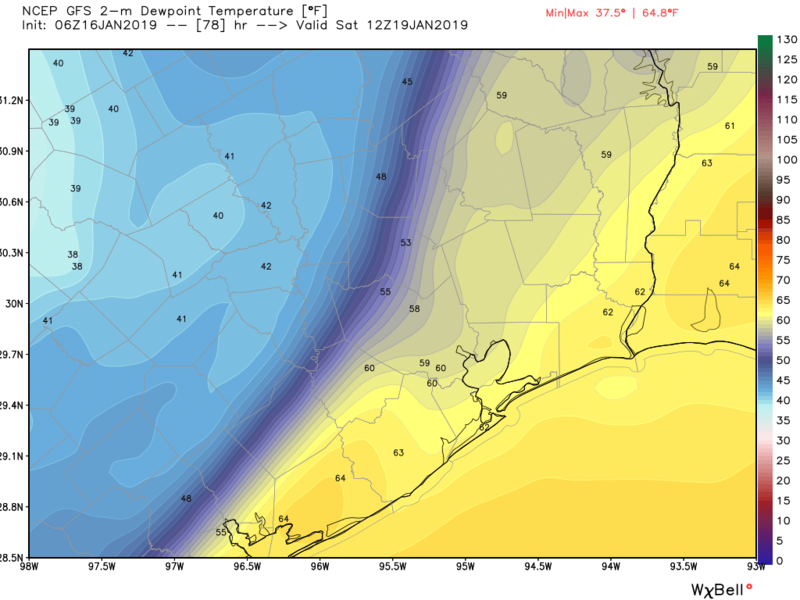 Is there any chance that the cold front will not dip into Houston on Saturday morning causing a drop of temp and strong winds? Will the skies be clear on Sunday night into Monday morning for watching the super blood wolf moon lunar eclipse? It sounds like yes but just making sure. Eric, I’m surprised you havent mentioned the lunar eclipse Sunday night/Monday morning. I will have to rectify that Thursday! Since there wasn’t a comment section for the Reliant 2019 sponsorship, I’ll add my thanks here on today’s post! 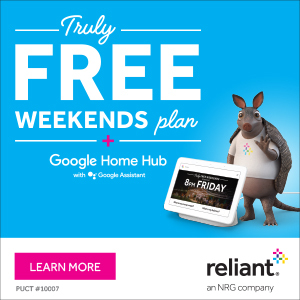 Thank you, Reliant for continuing to underwrite this wonderful website! The front on its own is bracing, but when it’s a 40+ degree drop, that’s just brutal. Any reason to think that confluence of fairly warm and really cold air might actually spin up heavier rain than anticipated? And I know I’ve asked before and you’ve told me, but I still wish these super cold fronts came in dry. Hauling in waterlogged plants is a drag, plus it confuses the heck out of the trees.